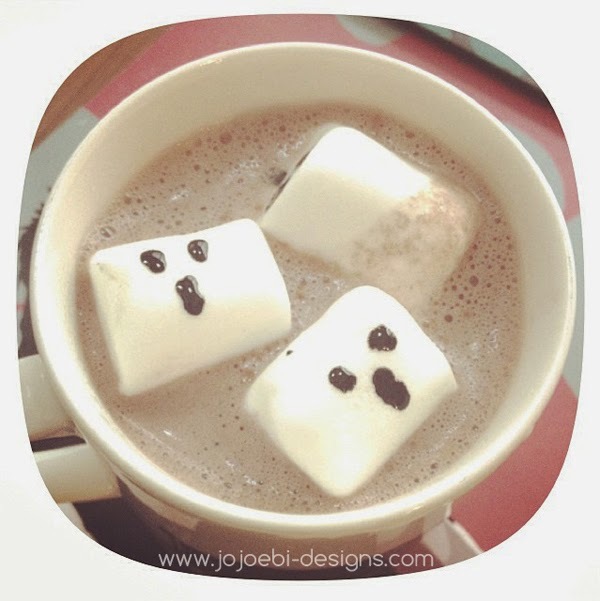 jojoebi designs: Spooky Cocoa Anyone? Well yesterday turned out to be one THOSE days - you know the sort. Ebi-kun only had a half day at school so I tried to jam as much as possible in for the day before he got home. Hubby had left late because he had a seminar to go to in town and it didn't start until 9am so he stopped for a Starbucks and some downtime, only to find that he got the date wrong, so he'll be doing it all again next week! Now I am sitting in waiting for the plumb to arrive and feeling grateful for the constant water supply we usually have, it's so easy to take for granted these things! But not having water (we had to turn off the mains) is driving me mad, that and all the chaos I'm sat in...add the contents of the kitchen drawers to the piles of packages to go out! I just want ti fixed! On the upside, I was inspired to make Ebi-kun spooky hot cocoa. Basically, hot cocoa with marshmallows, I used black food colour to paint on ghost faces, looks really cool when they were half melted and pretty disgusting when just the face was left! Big hit with the boy though, try it!